Subaru has unveiled the new Cross Sport Design Concept. 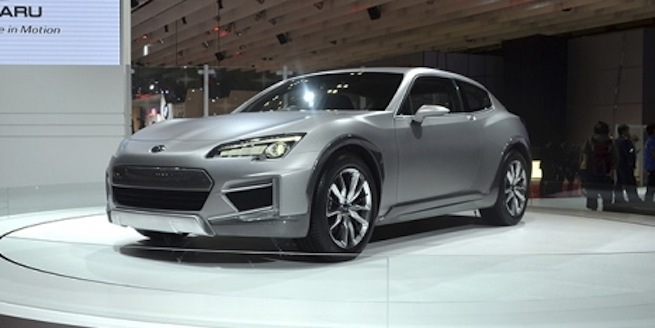 Could it really be a forerunner of a future BRZ Shooting Brake? The concept car recently made its world premiere at the Tokyo Motor Show 2013. The unique car flew under the radar at the show, but in a revealing interview with motoring.com.au at the show, Subaru insiders revealed some interesting information. In a press release before the show, Subaru told us the Cross Sport Design Concept is a combination of “sport” and “utility.” Both aspects which have been refined by Subaru over the years. The body is compact with overall length of 4,300 mm. It featured things like easy seat access, comfortable interior, and abundant luggage space. But what what makes the Cross Sport Design Concept most interesting is that Subaru says it allows for “brisk driving” and is what Subaru perceives to be the next trend in urban SUVs. Subaru offered few other details, but the two-door wagon is rear-wheel drive, features two large rear exhaust outlets and is believed to be based on the BRZ platform. According to motoring.com.au, the Subaru Cross Sport Design Concept is a “design proposal for a BRZ wagon.” A Subaru insider interview revealed that the concept hints at a shooting brake version of the BRZ. The Subaru source said the concept was designed by Subaru to test public reaction of the idea of a potential shooting brake version of the BRZ. It looks like Subaru is testing the waters to see if consumer interest is there for a BRZ Shooting Brake. Subaru saw how successful the BRZ project has been, and will continue to explore “out-of-the-box” ideas in the future. Unfortunately it doesn’t look like a convertible BRZ will be one of them. As we reported here, Subaru says it has no plans to offer a convertible version of its BRZ based on the Toyota FT-86 Open concept, which made another appearance at the recent Tokyo Motor Show. But in this writers opinion, Subaru should definitely pursue the idea of the BRZ Shooting Brake. If Subaru would put a 300+ hp turbo four cylinder Boxer powerplant and a sport-tuned suspension in this BRZ SUV, buyers would storm Subaru showrooms to get it. Tell us your opinion of a BRZ Shooting Brake. I agree with Jonny, except I don't mind the hood scoop. Give me one of these with a turbo AWD system and let me have some fun! it looks as if it will be rear wheels powered. If so, I'm not interested. Subaru has become a pain.. Impreza looks like crap and XV is looks too much like an SUV (not to mention that it also looks like crap). I have my second five-door Impreza right now (2005) and unfortunatelly there is nothing in Subaru line-up I would like to replace it with. This could be it, but only with AWD and not a very powerfull engine, preferably diesel. Unfortunatelly, this seems unrealistic.